Near the entrance to the palace is a Visitor’s Center that contains a gift shop and a little exhibit that showcases the building’s history with a free audio tour. There were no guided tours that day – or on any of the days I would end up in front of the Palace that year, peering in with growing curiosity. Whenever I inquired about going inside the building, the employee at the Visitor’s Center would deflect from the question and point me towards the audio tour I was already very familiar with. My day finally came when it was announced we’d be getting an exclusive tour of the palace with our War and Peace class that’s part of the Humanities Lab track of the Honours College. The course focused on memories of war as represented through different mediums, and that day the topic was on art. The Peace Palace (Vredespaleis in Dutch) opened in 1913 to house the Permanent Court of Arbitration and eventually the International Court of Justice (which is a big deal since this is the primary judicial branch of the United Nations). The building itself is meant to embody peace through both its architecture and interior design. My favorite fact about this place is that many different countries donated something to the building as symbolic of their support for peace. The most notable one may be the clock tower donated by Switzerland. Many donations were in the form of art, and our tour guide (who was very pleasant and very good at story-telling) led us through the courts and halls explaining the origins and meanings behind the sculptures and paintings that adorned the palace. We saw powerful sculptures depicting different interpretations of Lady Justice, and hand-woven Japanese tapestries of serene scenes and beautiful birds. Even the ceiling art told love stories, and stained glass windows had themes of astronomy. The class was later led into a courtroom where each student had to choose between ‘peace’ or ‘justice.’ The groups were seated on opposite sides of the room where we discussed the complexities of this choice. I wasn’t expecting to feel moved by this field trip but I was! The symbolism within the palace is very powerful and I recommend the tour to anyone who can get their hands on it. 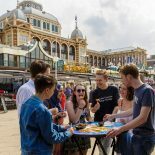 This entry was posted on January 10, 2016 by Sabrina@theleidener in Living in Holland, Student Life, Study.